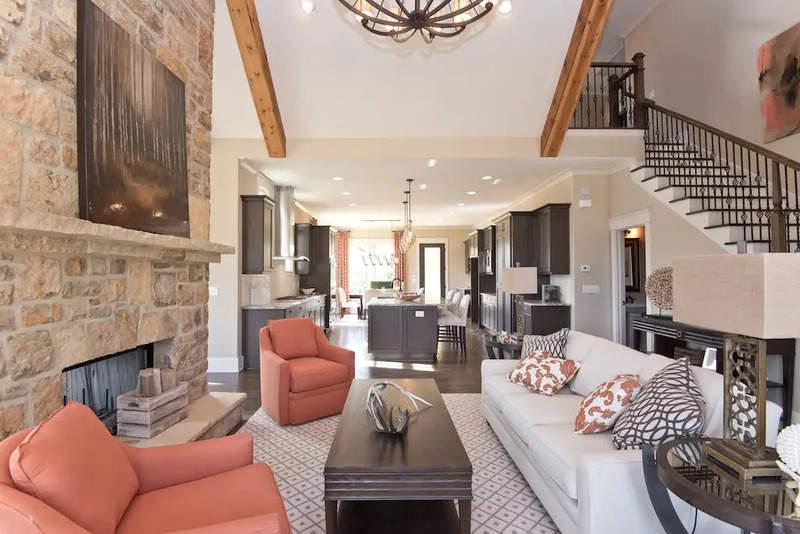 Open concept floor plans are a standard feature in many new construction homes. Why? Because today’s homeowners are increasingly looking for a spacious design that allows for flexible, functional living. We have experience in building open concept floor plans that help embellish your new home and transform it into the home of your dreams. Each of our open-concept floor plans has features that make it unique. You’ll enjoy all the luxurious features Brock Built is known for throughout Atlanta. To inspire your inner interior designer, here are 3 tips to decorate your open-concept floor plan. The first place to start when deciding on how to decorate your new home is the color scheme. The rooms in open-concept floor plans often flow together. For this reason, it’s important to select a color palette that can compliment each space in the open layout of your new home. This includes rooms such as the kitchen, dining area, family room. 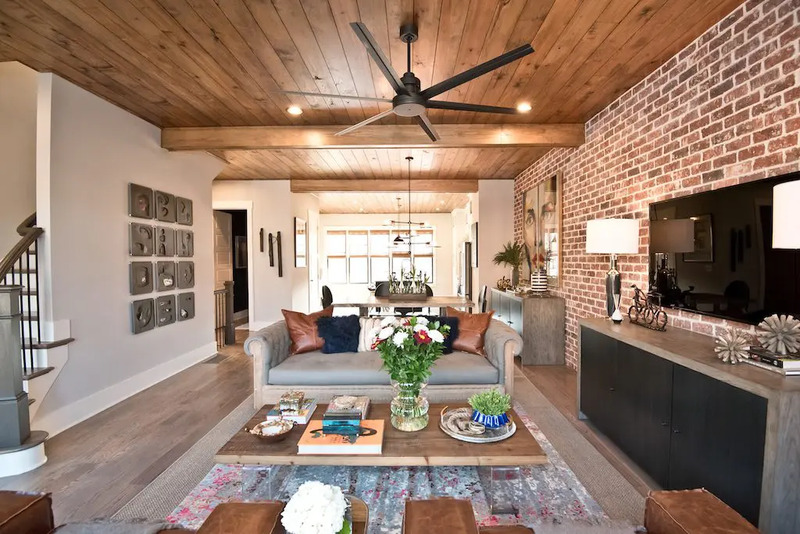 For instance, the home above from Westside Station utilizes a neutral color palette with greys and light shades of brown. 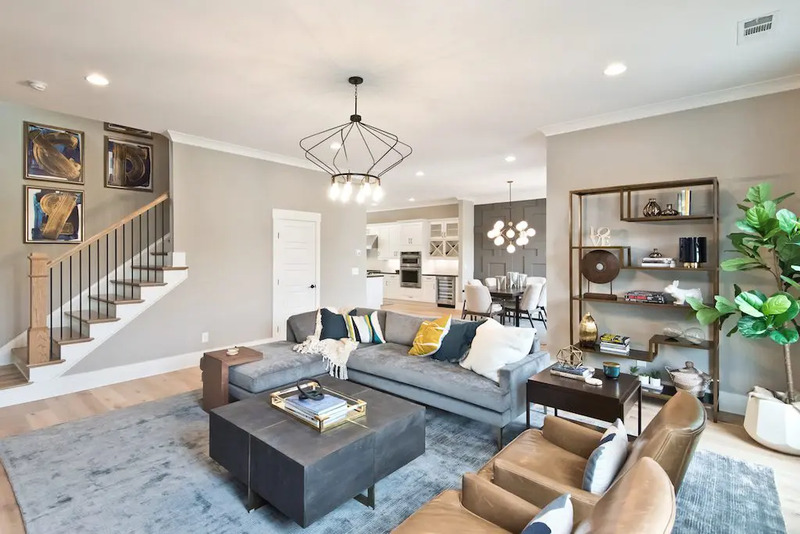 From the accent wall in the dining area to the colors accenting the living room and the countertops in the kitchen, they all work together to create one cohesive look and feel. The importance of strategically placed lighting in your new home cannot be expressed enough. The lighting in an open-concept floor plan has to take into account the wide array of uses for each room. As an example, the dining area may not only serve as a place for eating, but also a space for the kids to do their homework after school. Regardless of whether you select pendant lights, the addition of task lighting is a crucial element in your new home. In the kitchen you’ll want to have ample lighting for both preparing family dinners and making delicious treats together as a family. Featured home from West Highlands. Because open-concept floor plans don’t typically have defined borders between rooms, you’re responsible for creating those boundaries on your own. The solution to this is simpler than you think! It all comes down to how you utilize your furniture in the space. As seen in the home above from Adams Vineyard, angling your furniture helps create a subtle, natural divide in the room. This segments the open space without taking away from the appeal of an open-concept floor plan. You can also use this approach to establish smaller task areas throughout your home. These might include a reading nook or a small workstation. With the holiday season upon us, there’s no better time than now to find your new home with an open-concept floor plan. From West Midtown to East Atlanta and several Metro Atlanta locations, we have several new homes available now. 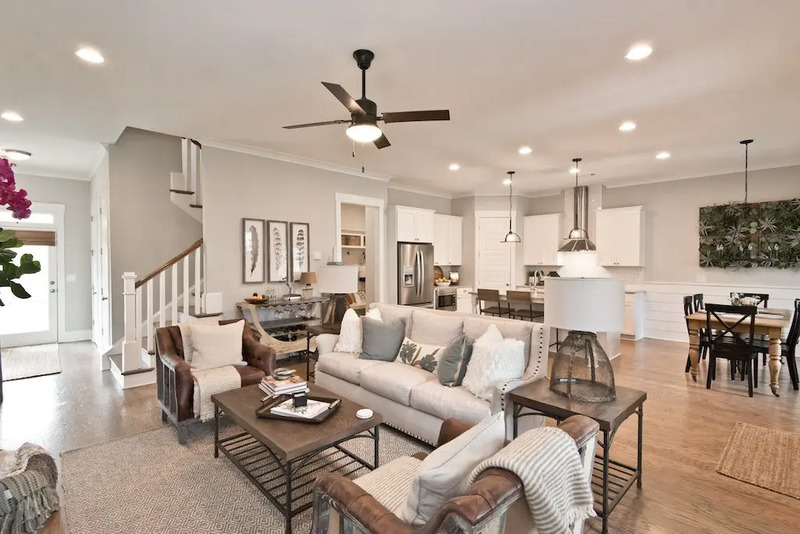 Contact us today to let us help you find the open-concept floor plan that’s right for you in the neighborhood that fits your family’s life + style.